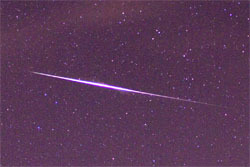 Update Dec 5, 2012 — After examining this meteor photo Bob Lunsford author of Meteors and How to Observer Them let me know that this is not actually a Leonid meteor, but rather a November Iota Draconids Meteor. 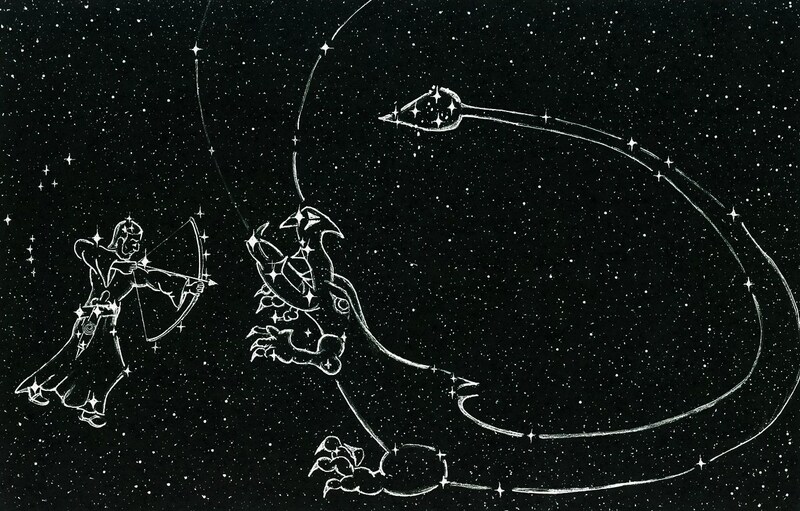 Despite the fact that it occurred during the leonid meteor shower peak and actually appears inside the Constellation Leo, the meteor does not align with the Leo radiant, rather this meteor originates from the Draconid radiant. I’ve been burning the candle at both ends, between astronomy and meteorite hunting not to mention my real job and home life. My wife went away for the weekend to visit with her family and I’ve been pulling Mr. Mom duty. 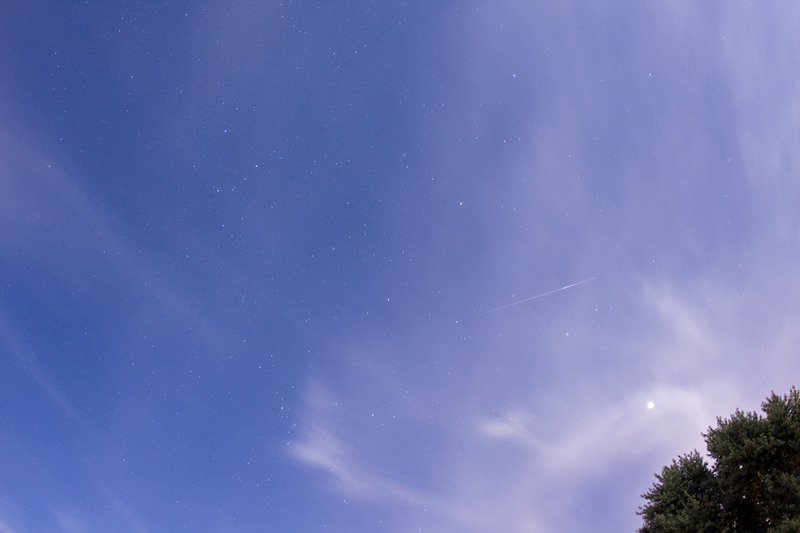 Yes its tiring, but last night was the peak of the Leonids, the moon set early and there were no clouds. So I setup a camera on my balcony and went to bed early, but shot all night long. While reviewing the pics this morning, I was a little disappointed by the lack of meteors I had captured, that is until I came across this guy. I only caught 2 meteors the whole night, but it was worth it for this bright Leonid. 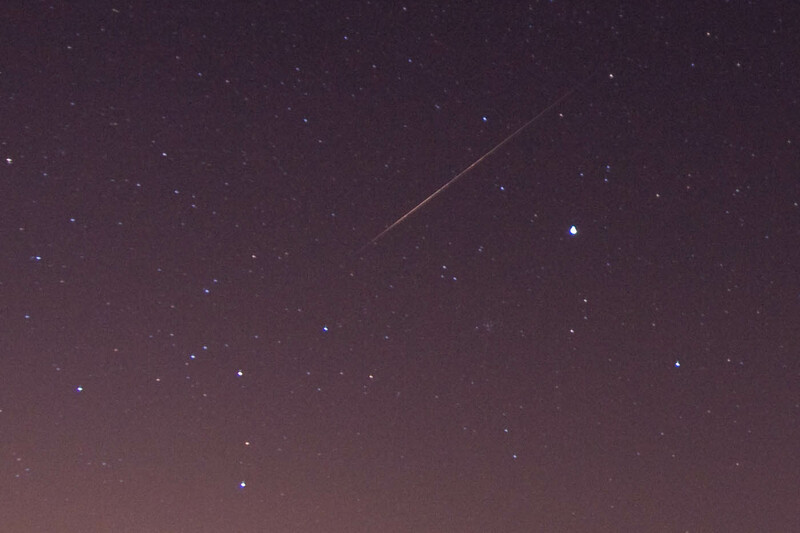 The picture above is a full resolution crop of just the meteor. Here is the full frame reduced in size. Image taken with Canon 5d Mark II Camera and Canon 35mm f1.4 L USM EF Lens. 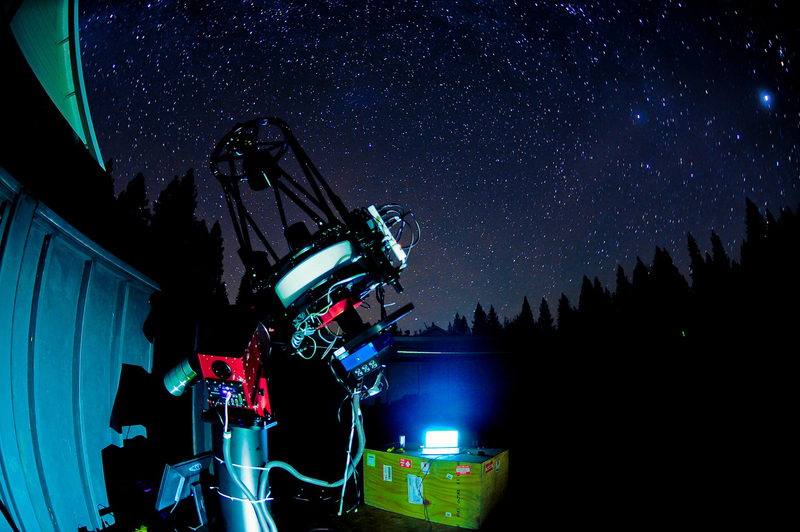 Tripod mounted (no tracking) 25 second exposure @ ISO 400. I flew out to Fresno California to observe the Perseid meteor shower peak with Brendan Fallon my old friend, college roommate and meteorite hunting companion. 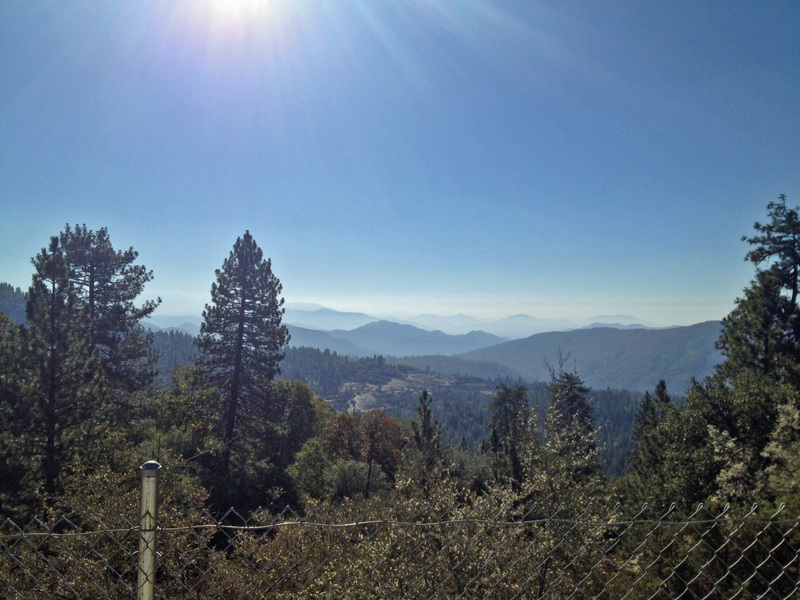 We made it to the Yosemite National Park by early afternoon Friday, checked out the valley and scoped out possible locations for observing and photographing the meteor shower. 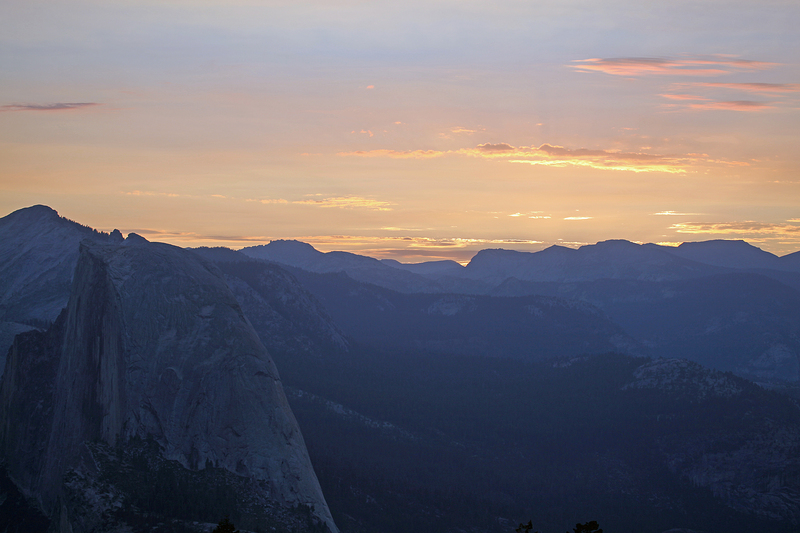 Later in the day, we worked our way up to glacier point to observe the shower the night before the peak. Glacier point is known as an astronomers hangout and many of the rangers recommended it to us as the place to be. I was surprised by how many people where there to watch the shower Everyone was talking about the shower and really excited about it . 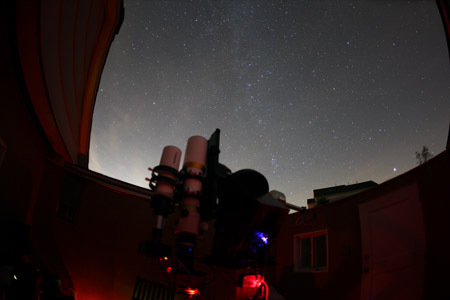 The San Jose Astronomical Society was hosting a star party on the ridge and over 100 people where there to see the show. 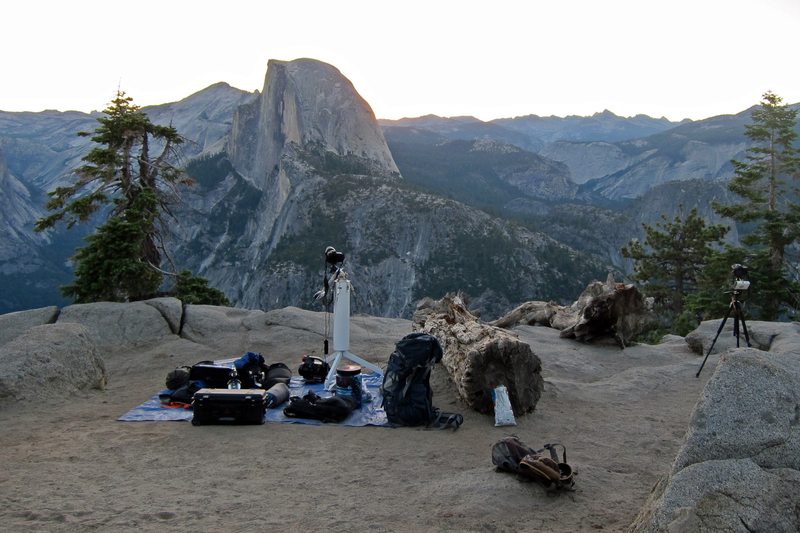 We found a little area outside the fences on the edge of Glacier Point and setup our equipment with intentions of staying there all night. Camping is not allowed at attractions like Glacier Point but staying there all night, so long as you’re not sleeping or pitching a tent is totally fine. 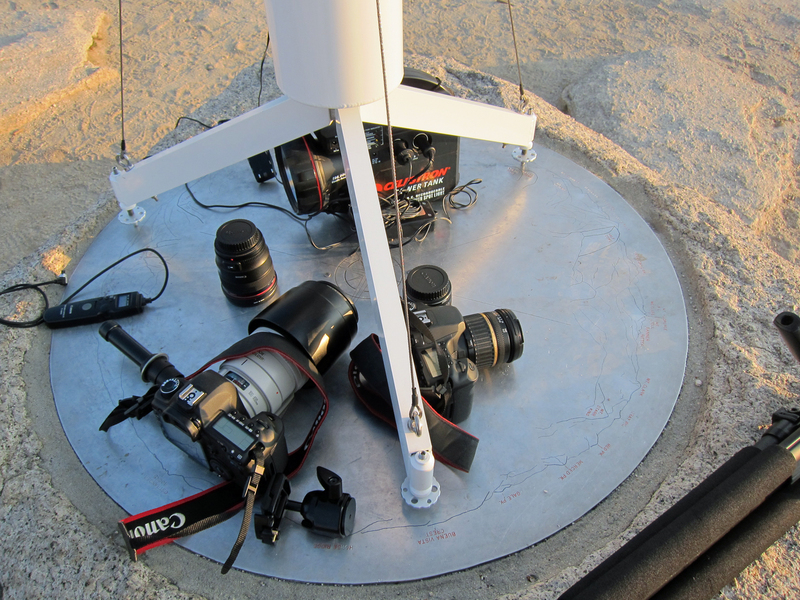 We were all setup a little before sunset and shot the skies with two cameras the entire night. I spent most of the night fiddling with the cameras and had less time to relax and observe the shower, but Brendan was able to kick back and counted over 100 meteors the first night. I was not keeping a good count, being distracted by technical devices, but registered about 50-60 meteors. 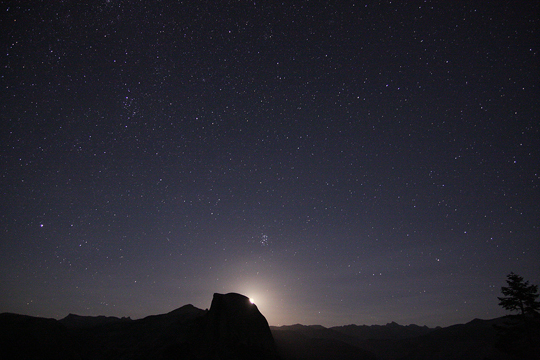 We both stayed up the entire night, and as celestial fortune would have it, on this night and only this night the moon, the Pleiades, Jupiter, Venus and the Sun would all rise over half dome. 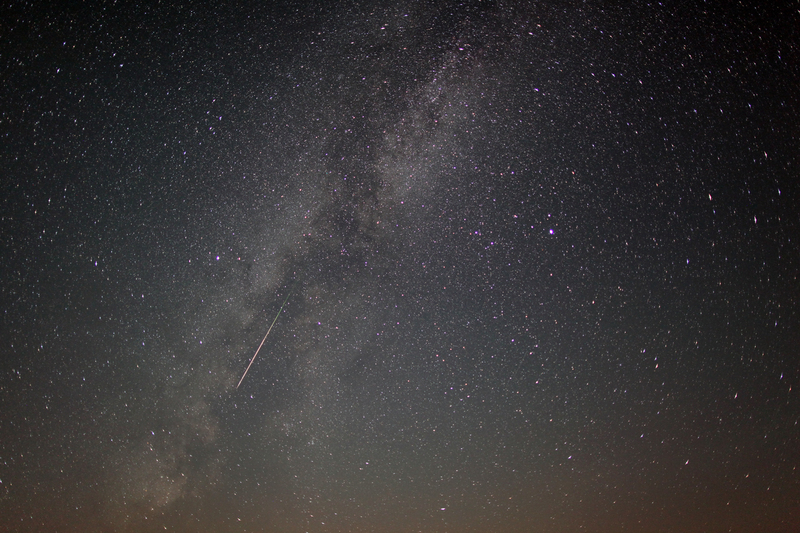 We were in the perfect location to watch all of this along with thousands of shooting stars all over the place. It was amazing. After the sun rose around 7:00 AM we packed up our gear and slept for the rest of the day at a hotel an hour away from the park. On Saturday, we made our way back to Yosemite by 7:00 PM and headed straight for Sentinel Dome. The top of the dome is about an hour hike from the parking lot and we each had packs filled with camera equipment and camping gear. At the peak of the dome in the center of the space, there was a big rock with a leveled metal compass in the middle. It was the perfect perch for my portable astrotech pier and tracking mount. 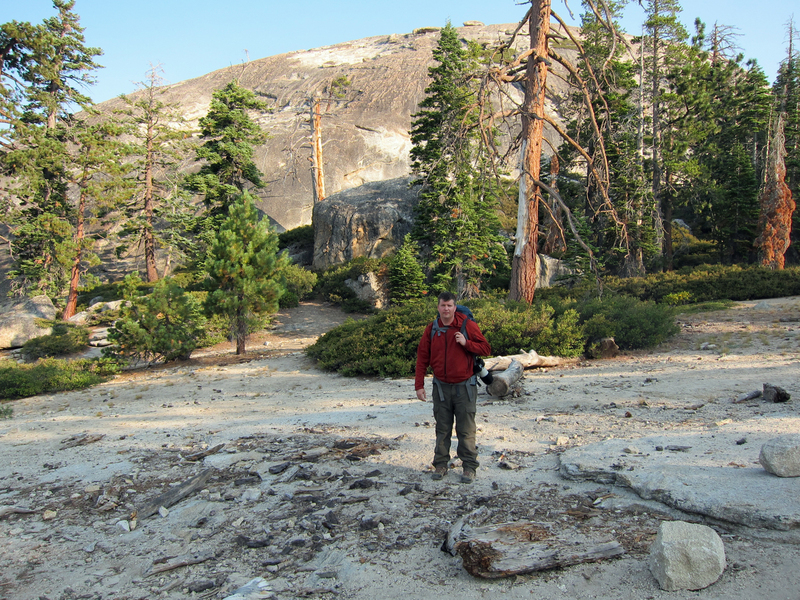 I was so amped to be on top of Sentinel Dome at 8,100 feet above sea level with 360 degree views of the entire park. It was amazing! 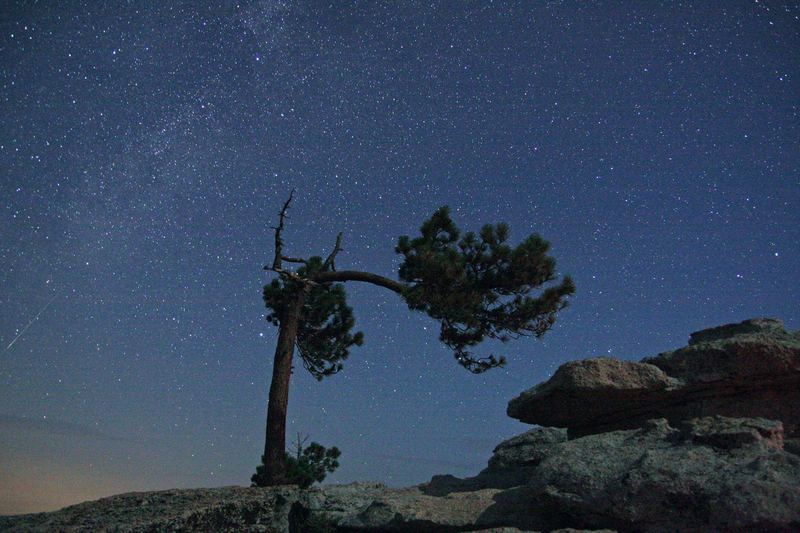 After spending a night on Sentinel Dome I am convinced this is the BEST place on the planet to observe a meteor shower. Every landscape view was breath taking, the skies were as dark as I’ve ever seen and there were meteors everywhere every minute. What else could you ask for? 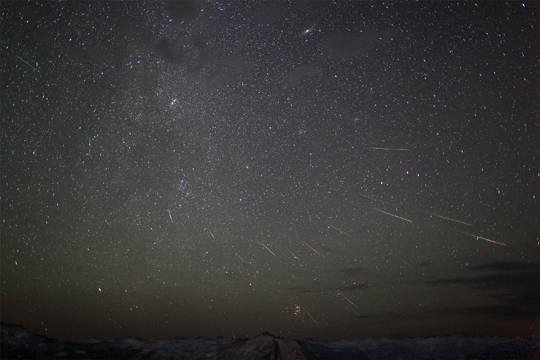 I was much better about my counting this night and we played a counting game together, competing to see who would observe more meteors. 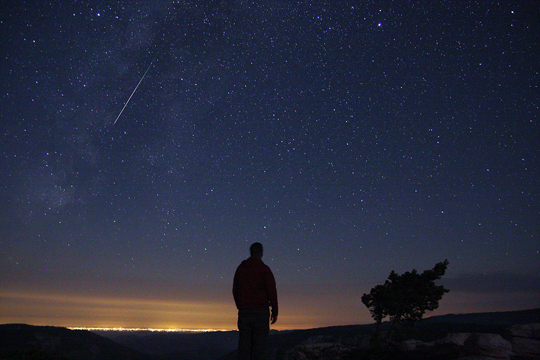 Each time one of us saw a meteor we needed to say our count out-loud followed by the other persons count. It was a competition the entire night and helped keep us awake, alert and engaged in the shower. 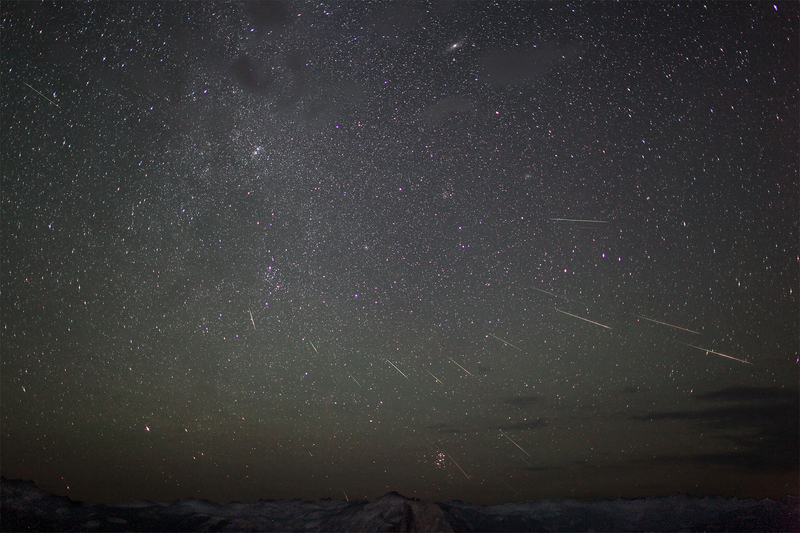 For the night of the peak I was able to count 250 meteors and Brendan counted 246. Sentinel Dome is harder to get to than Glacier Point and we thought we would have the whole place to ourselves, especially since no-one was there after sun-set, but believe it or not throughout the night, several parties arrived at the dome after dark. Some getting there as late as two or three in the morning. I was again impressed with how many people who were interested in the shower and dedicated enough to make it out. We all shared a common bond watching the shower together from one of the highest points in Yosemite park. That morning we watched the sun rise again and then hiked back to our car. We were both exhausted and sleep deprived but still wide awake and pumped up from the adrenaline of the park, the meteors and the observing experience. 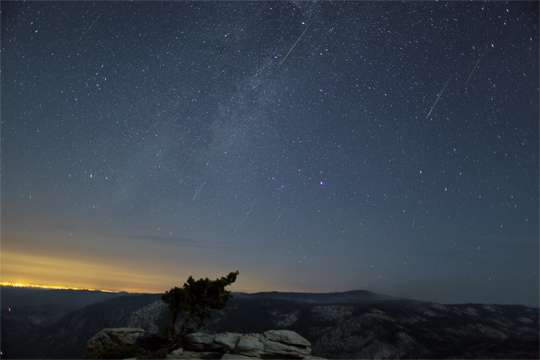 To date, this is the very best meteor observing experience I have ever had and I am convinced Yosemite and specifically Sentinel Dome is the best meteor observing location in the world for viewing the Perseid Meteor Shower. 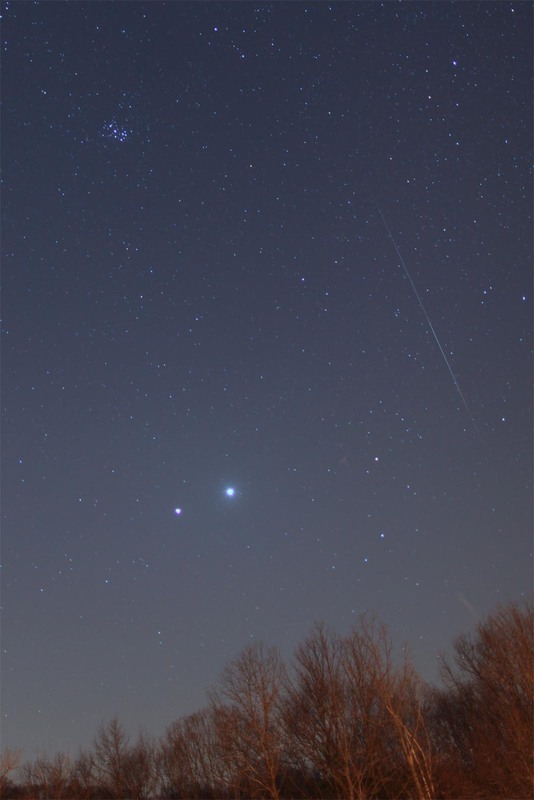 Here’s a photo from March 14th of Jupiter, Venus and a meteor. Venus is the bright object in the lower side of the picture. 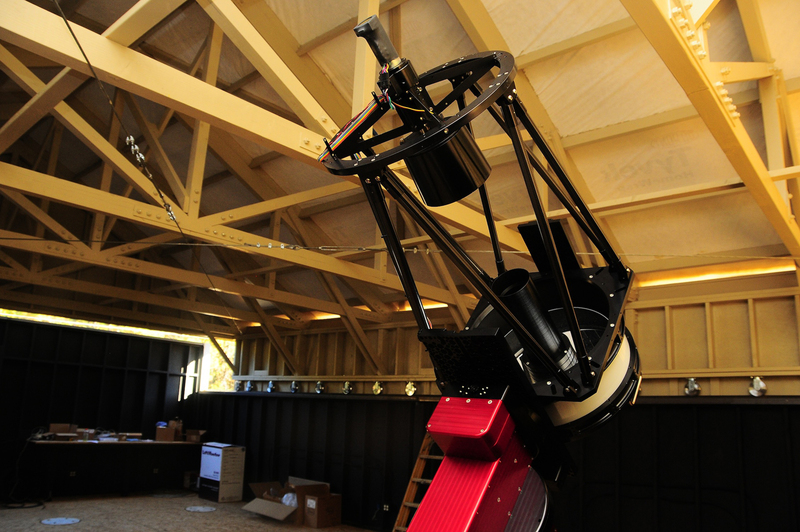 Jupiter is to its right. 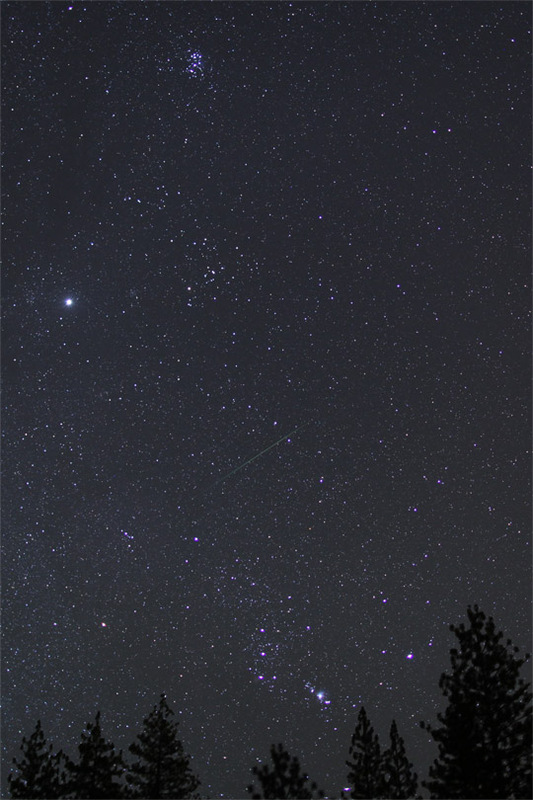 The Pleiades is also visible in the upper left. 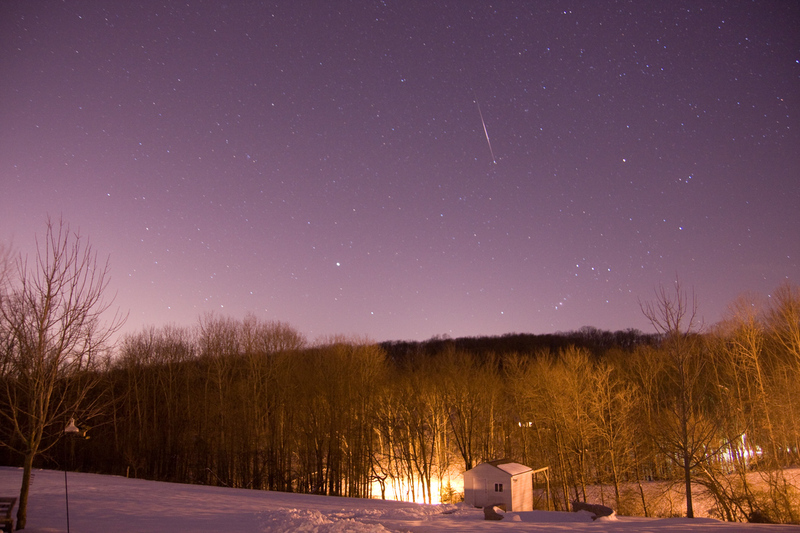 We had near perfect conditions in Freeland MD for the peak of the Quadrantids meteor shower on the morning of Jan 4th, 2012. Here is a composite image containing 6 Quadrantid meteors captured between 2 and 4 am EDT. I had a multitude of cameras setup to capture the show including: 2 DSLRs, 3 security cameras and a new Orion all sky camera. I’m glad I had a wide variety of instruments because some didn’t work at all and others worked better at some things and worse at others. 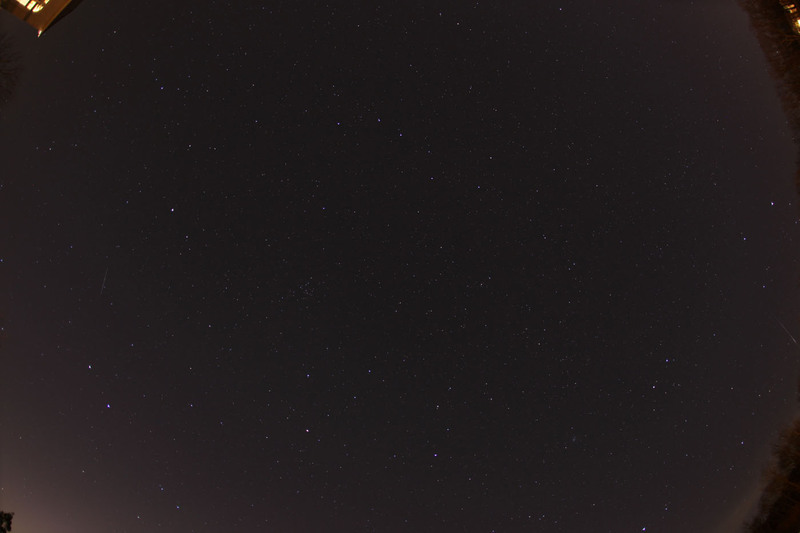 It was my first night using the all sky camera and I’m disappointed to admit that it captured ZERO meteors. I’m hoping I had a error in my operation. One of my DSLRs filled up the memory card after only 2 hours and I didn’t realize it till the morning. By far the security cameras picked up the most meteors, totaling 53. 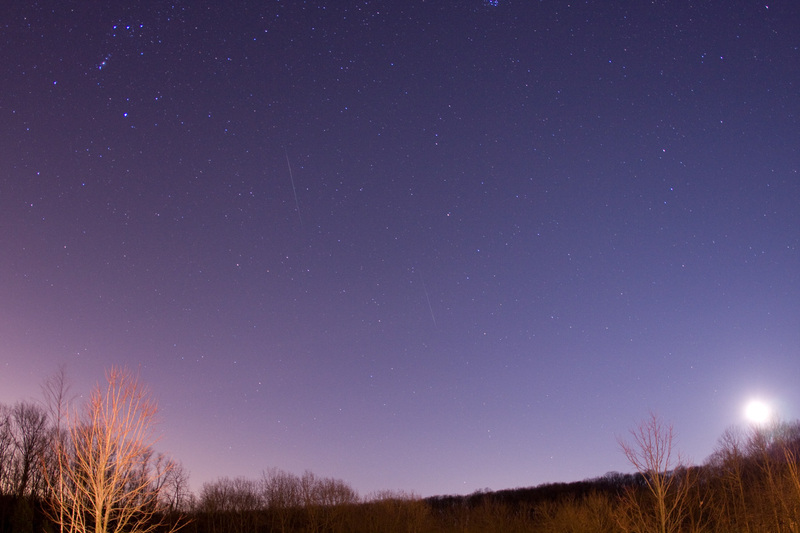 I found that most of these meteors were detected between 2-5 am. I also captured the most meteors in the southern skies at low elevations. Here’s a compilation video of all the meteors captured on the security cameras. 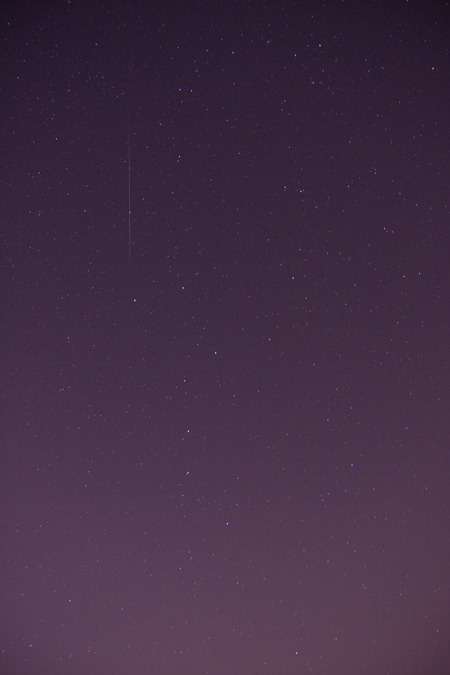 While reviewing the DSLR photos I was disappointed to find most of the meteors caught on the security cameras did not get caught on the DSLR. 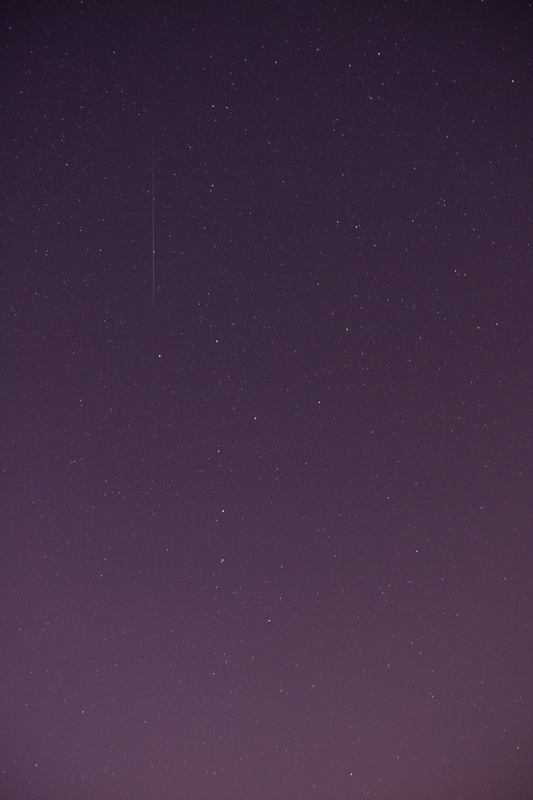 The DSLR only captured about 8 meteors total, compared to 53 on the security cameras, so clearly the DSLR lens is not catching everything. 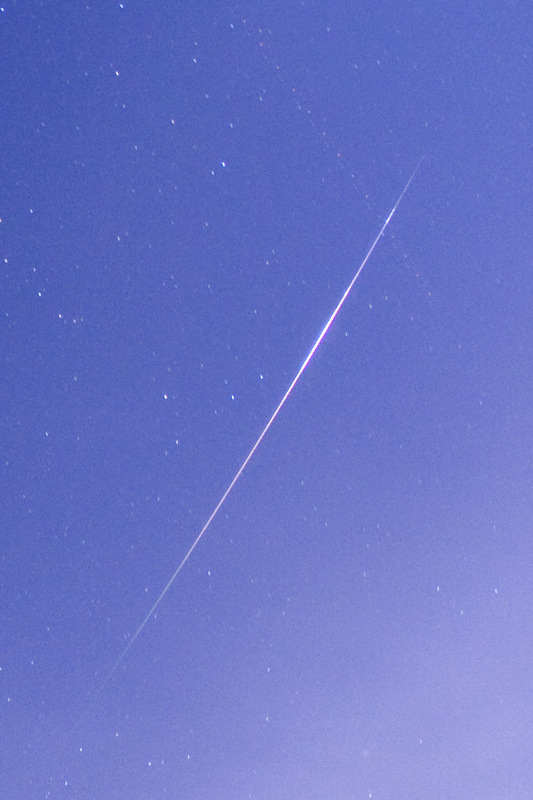 I did find this nice fireball that left a persistent train that last for a few minutes. 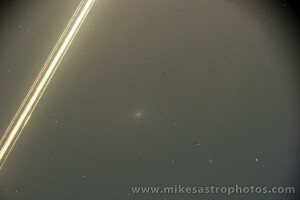 Here’s a full zoom image. Here’s a single exposure that caught two meteors within a 30 second period. 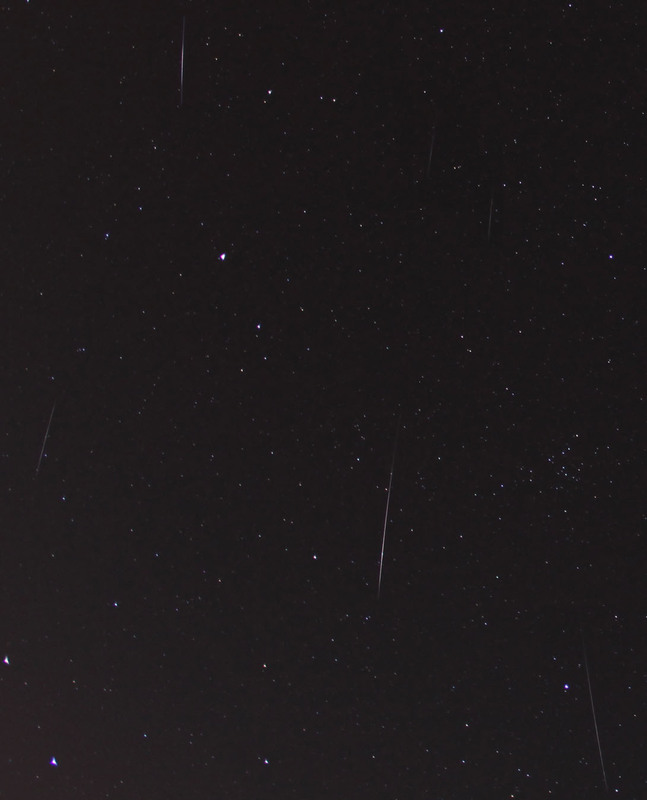 This DSLR exposure was also caught on video and both meteors happened at the same exact time! I repeated the sequence 3 times in the video. Overall, a strong performance for the Quadrantids IMO and a very great way to start 2012! Last night was the peak of the Geminid meteor shower. 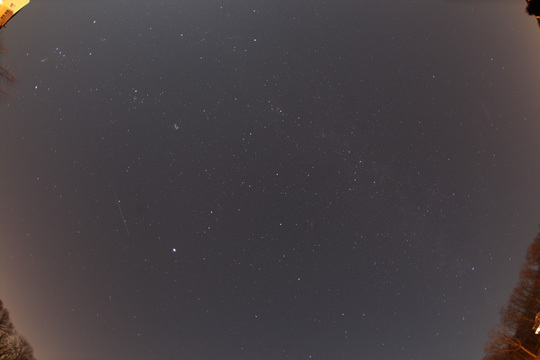 I setup my camera around 8:00 PM and photographed continuously through the night. 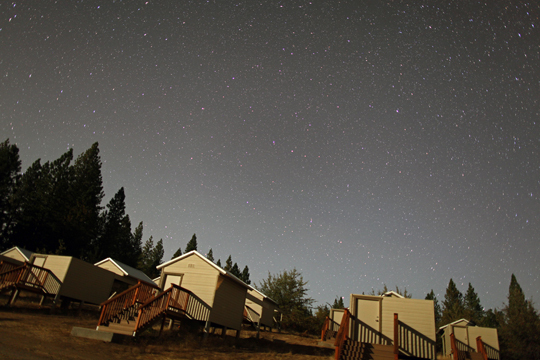 The sky was clear until about 2:00 am and then covered with clouds for the rest of the evening. 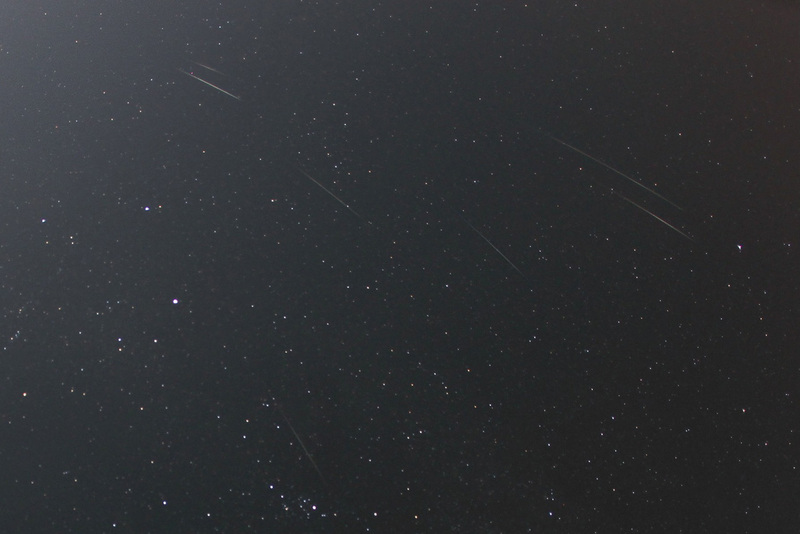 I was able to catch a total of 11 meteors in that 6 hour window. That’s pretty good considering there was a near full moon for most of the evening. 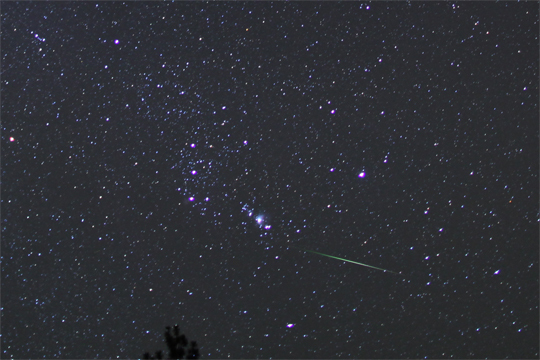 Here’s my final composite holding 7 of the best images from the night. 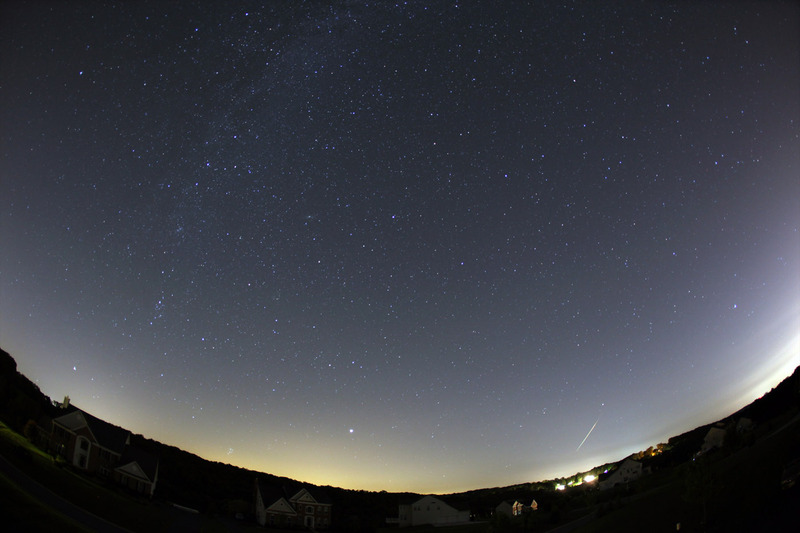 I used a Canon 5d Mark II camera with a fisheye 15 MM 1:2.8 lens. The extra large CCD inside the mark II used with the fish eye lens allows you to capture the whole sky. 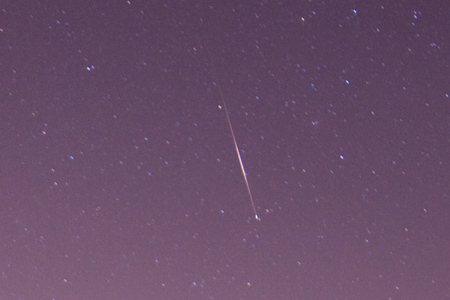 This really improves your odds of catching meteors! 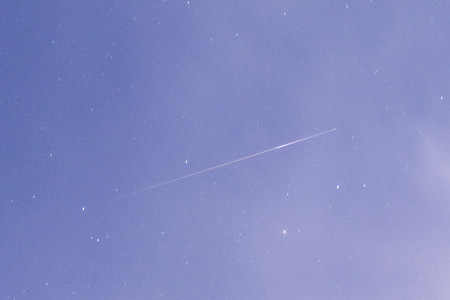 Here’s another Geminid meteor pic which shows the field of view through this system. We were without power for 3-4 days this week due to hurricane Irene. The power outage coincided with the new moon phase leaving the skies in northern Maryland darker than I have ever seen before. I was a little bummed that I couldn’t fire up the observatory, so I made the most of it and took some tripod shots of the Milky Way Galaxy. Here’s a lucky shot of a bright meteor, low on the horizon. Based on the elevation angle of 8º and assuming a 80km starting point for illuminated flight, this meteor would have been about 569km SE of my location or half the distance between Maryland and Bermuda. 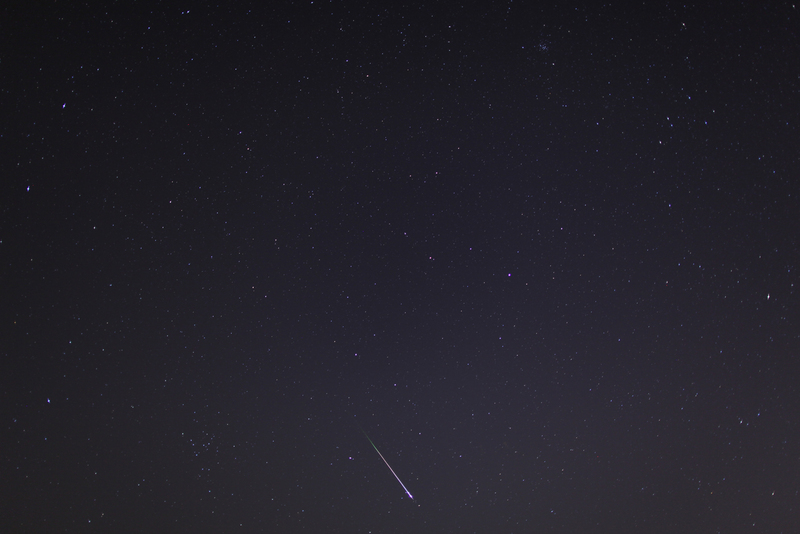 Here’s the meteor at full zoom resolution. 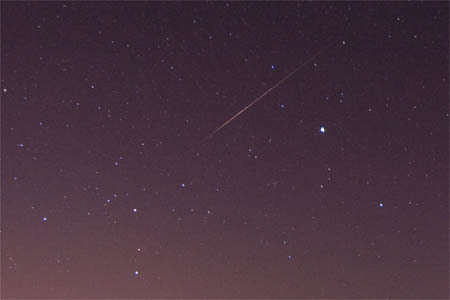 At a magnitude of 2.0, the bright star directly above the meteor is Diphda. 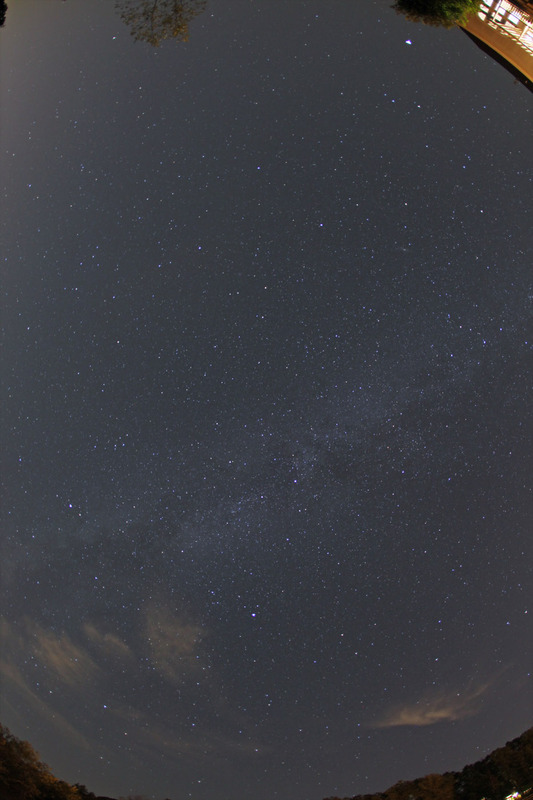 Here’s another shot of the Milky Way Galaxy from the backyard. The power went out early sunday morning. I finally got a generator on Tuesday. 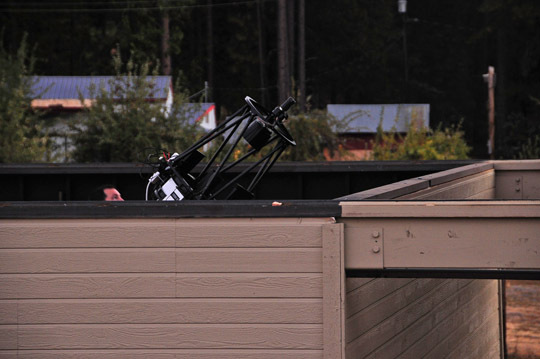 The first thing plugged into the generator was my observatory. 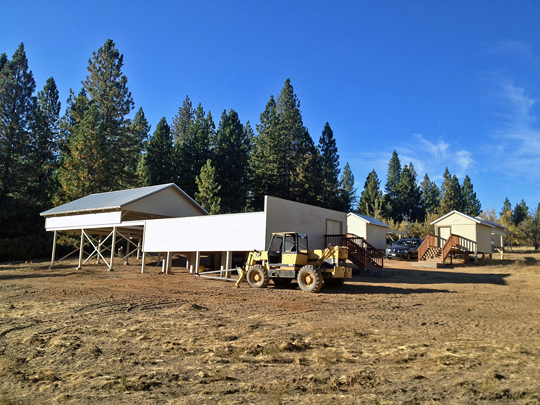 I was happy to learn that all equipment and PC fired up and operated perfectly on the generator power. We were happy to get our power turned back on Wednesday night. Many thanks to all of the utility workers from around the country who came to the east coast to fix our power lines. You guys are much appreciated! I’m hoping hurricane Katia will be a dud or misses us. 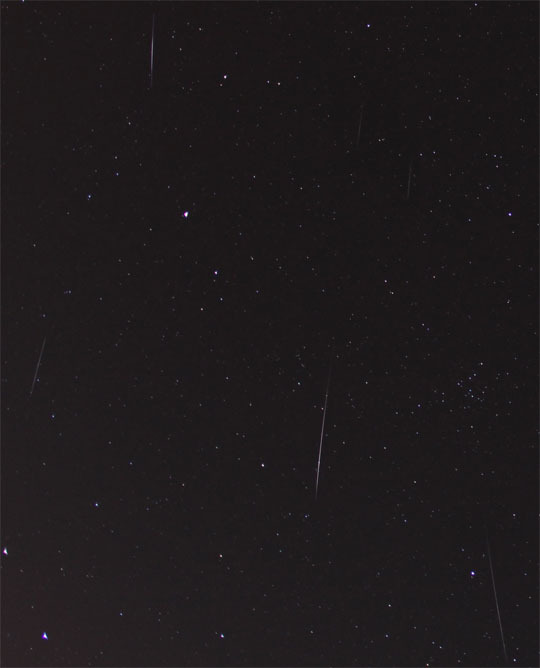 I imaged the Perseid Meteor Shower three nights this week capturing an average of four meteors each night. 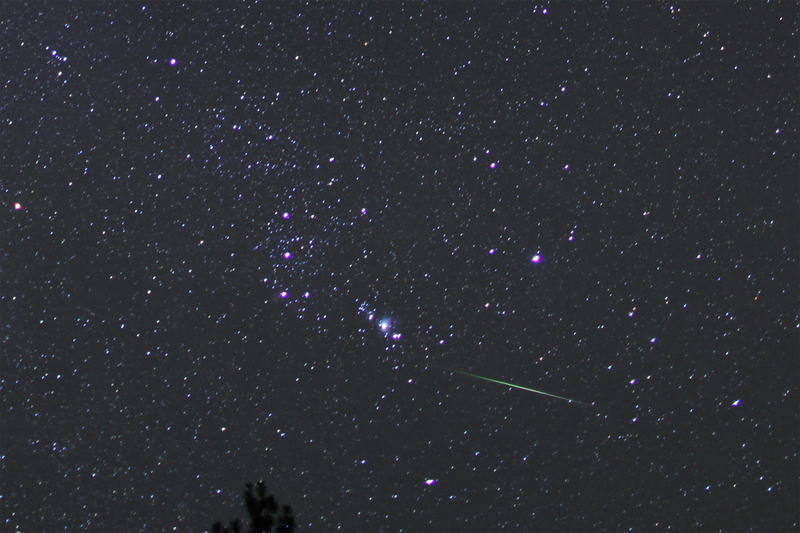 Here are the best two from the peak night. Both are fairly large, bright and long. 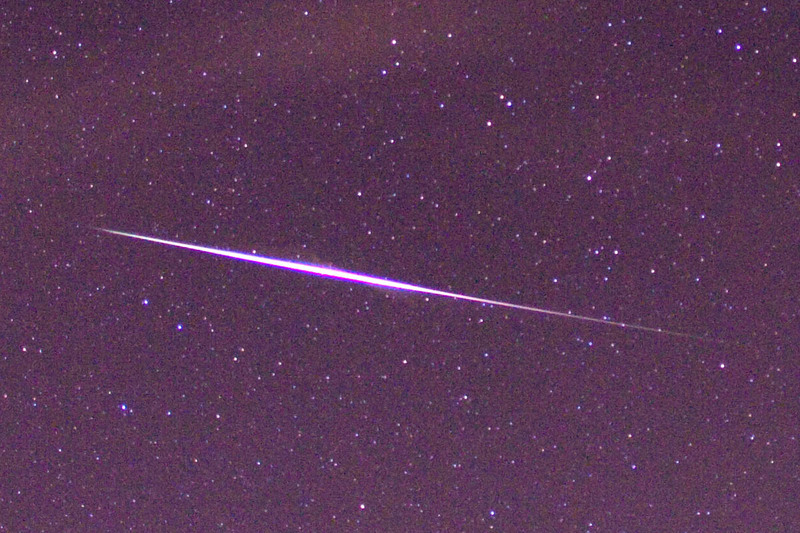 I think this one may be a small fireball. You can see Cassiopeia in the shot for reference. Some light cloud cover rolled in but it wasn’t enough to block this Perseid . 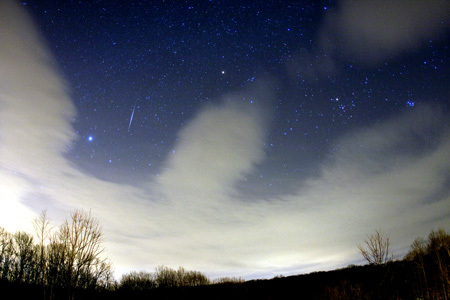 The 2011 Quadrantids Meteor Shower peaked this morning at 1:00 a.m. 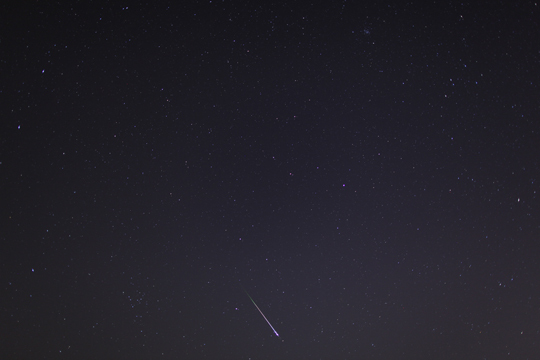 I took photos last night continuously from about 8:00 PM till dawn and only caught one meteor, but it was a good one. To see the full shot, click here. The cool thing about it is, the meteor left behind a visible smoke trail that showed up in 20+ consecutive frames after the flash. That’s more than 10 minutes! 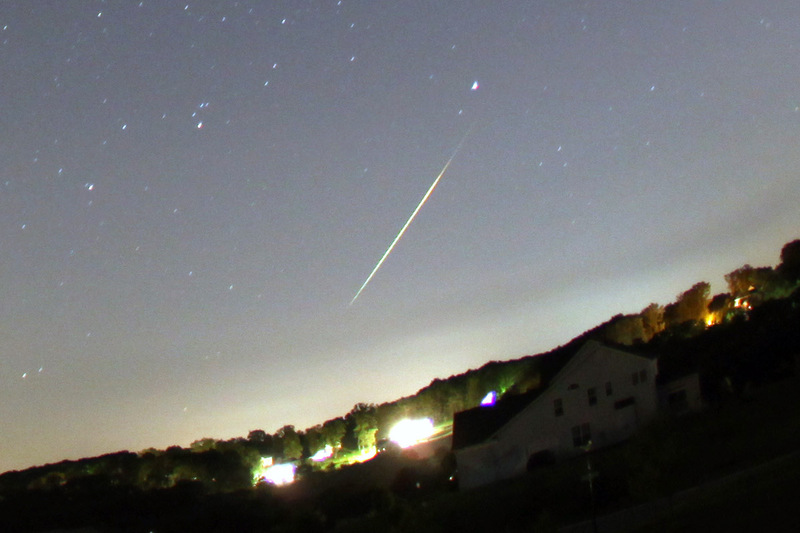 Its hard for me to say for sure, but I think this may have been a fireball. 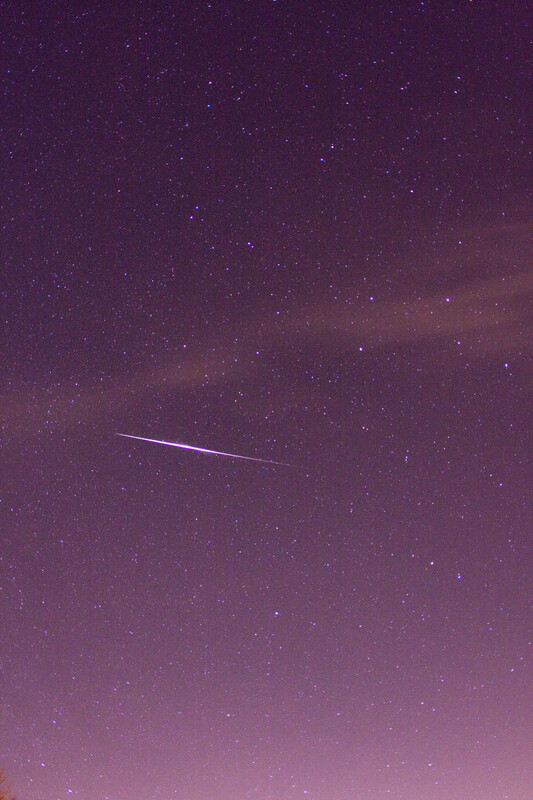 Here’s an animated sequence of about 10 frames that shows the smoke trail left by the meteor. 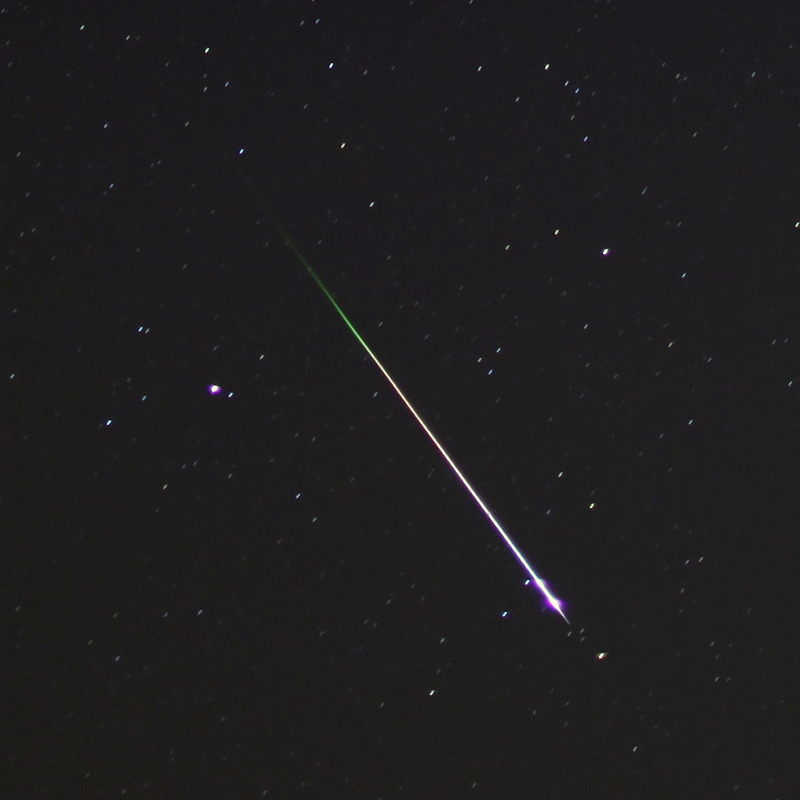 This shower will be active until January 10th and with all the fireball activity happening lately, it is worth checking out! As I was driving home today I realized that I would have probably caught this picture on one of my new security cameras. I knew the exact time was 2:43, so when I got home I checked the video log. Sure enough, I just barely caught it at the edge of the screen. Look in the center top of the video to see the fireball at the 2 second mark. You may need to replay the video a few times to get it. 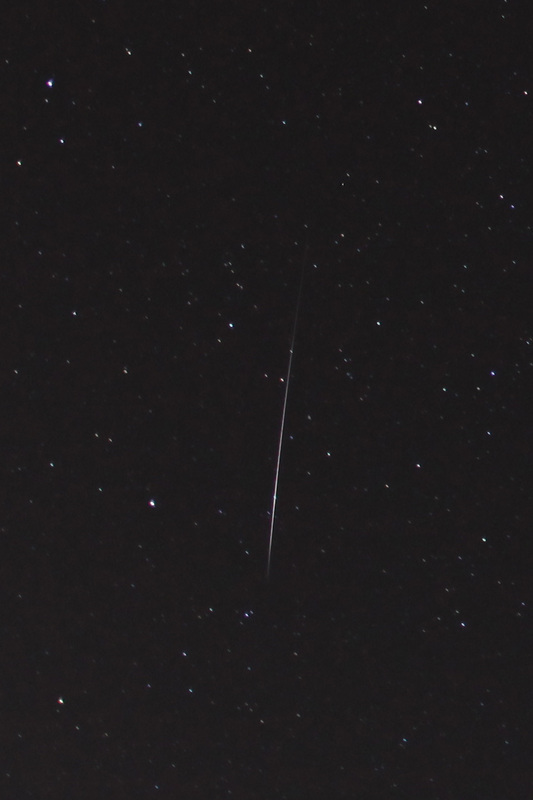 Over 2 nights of mostly cloudy weather I was able to capture 21 total meteor photos (out of 2000+ images). 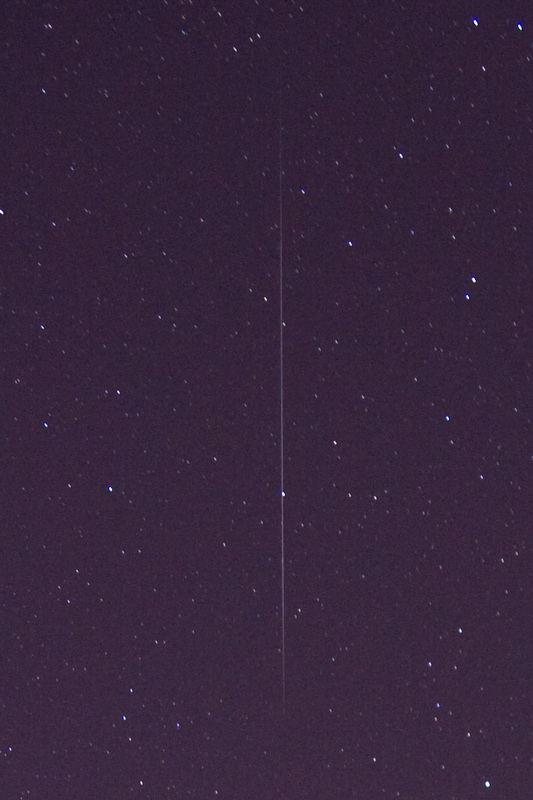 One of these exposures caught two meteors within the same shot (a 25 second time frame). 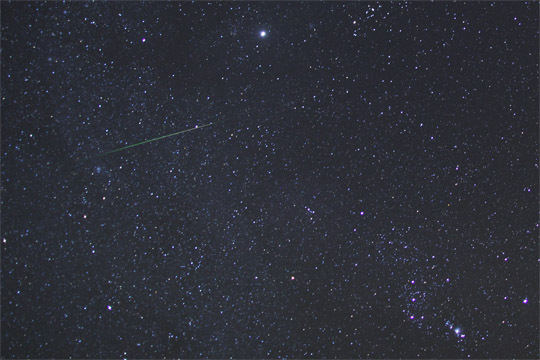 The Geminid Meteor Shower peaked before dawn this morning and observers around the globe are reporting one of the best showings in years boasting rates of over 100 meteors per hour. The east coast and much of the country was under clouds and snow storms. I setup my camera while it was cloudy hoping conditions might change. 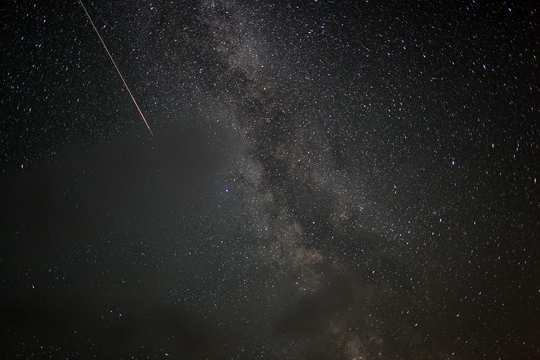 Fortunately between 2:30-4 am the clouds cleared up a bit and in that 1.5 hours I photographed 13 meteors. Its cloud tonight, but I’m trying the same plan again. Here’s one of the photos from last night. I’m still processing the other pictures and will post more later. The full moon on January 30th, 2010 was the biggest and brightest it will be all year according to space.com. 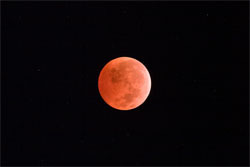 The moon travels in an elliptical orbit around the Earth and it is closer at some times than others. About 2 times a year this closeness coincides with a full moon and that’s what happened Saturday night. 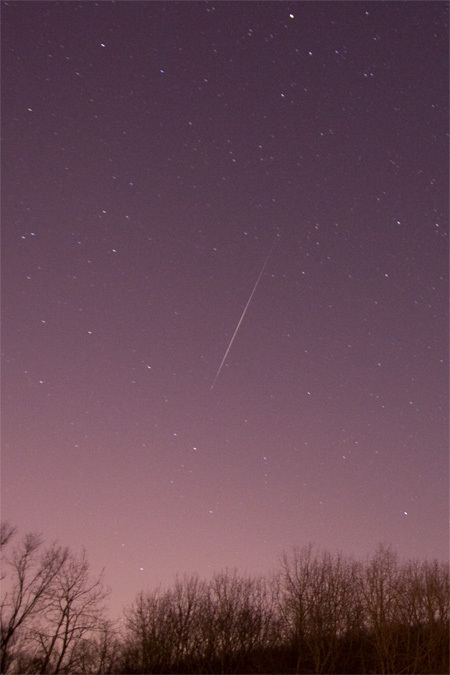 Despite the extra big full moon I tried doing some meteor photography Sunday night. I actually caught a couple. You can see in this picture the moon is huge. 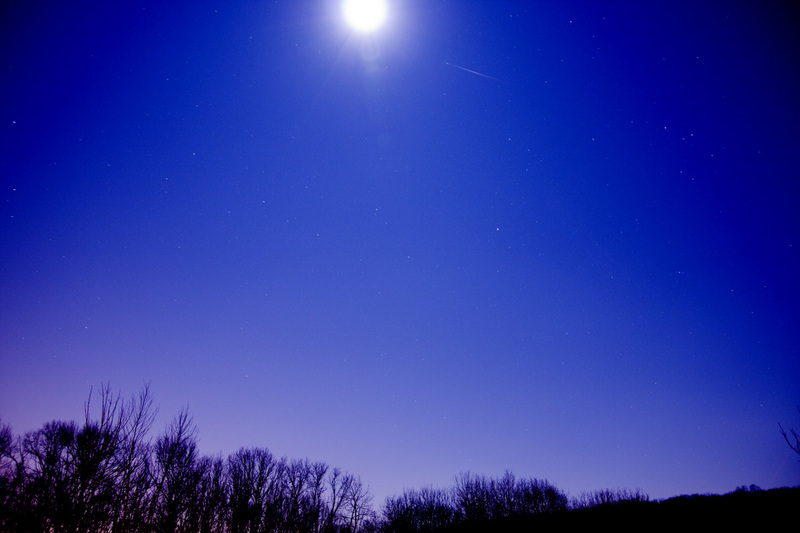 Part of this is due to the 25 second exposure, but even still, that’s a big moon. 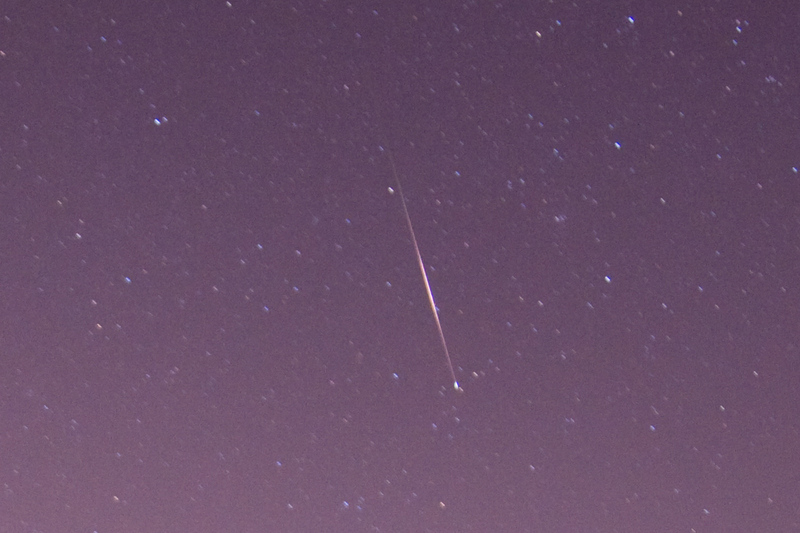 here’s a closeup of just the meteor. I’m surprised it was even visible with the light from the moon. 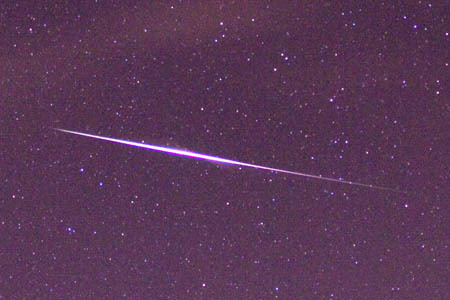 Here’s a cropped picture of a sporadic meteor from 4:20 am on January 10th, 2009. Here’s the full picture. 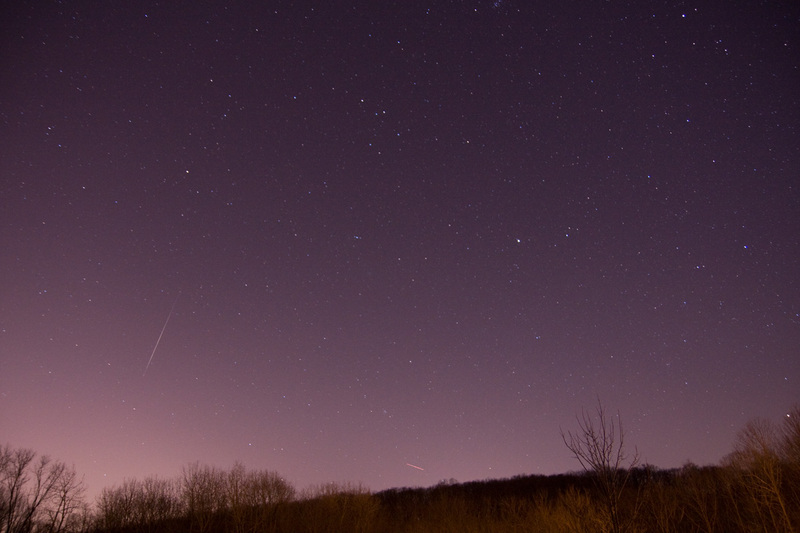 The trail on the left is a meteor. 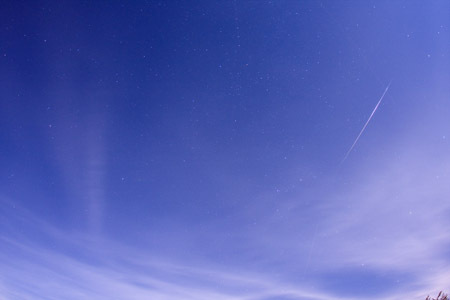 The small red line in the bottom center of the picture is a plane. 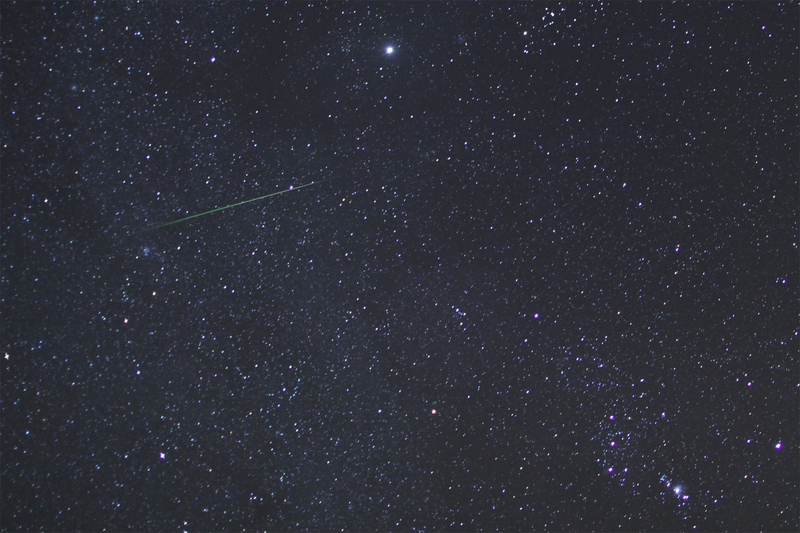 Here’s a sporadic meteor inside the constellation Canis Major (the dog). 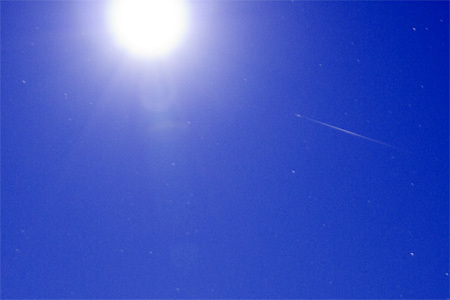 The bright star to the right is Sirius, the brightest star in the sky. 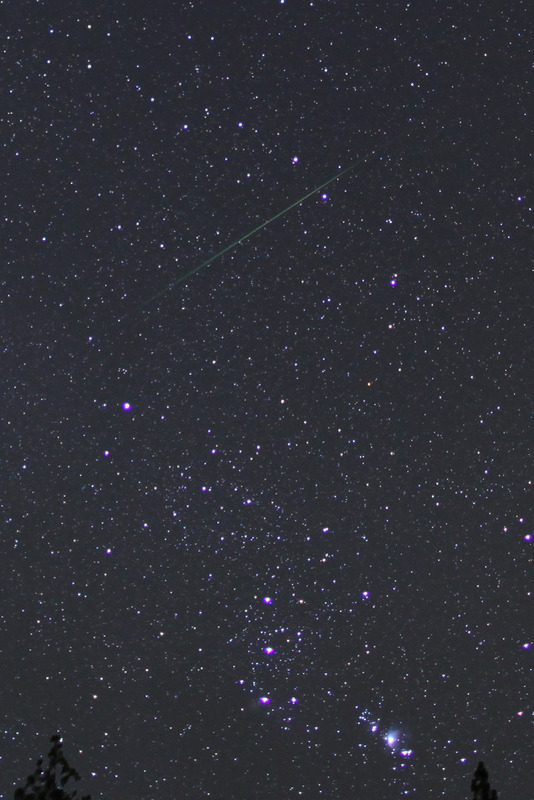 Here are two sporadic meteors I captured during the Ursids Meteor Shower. 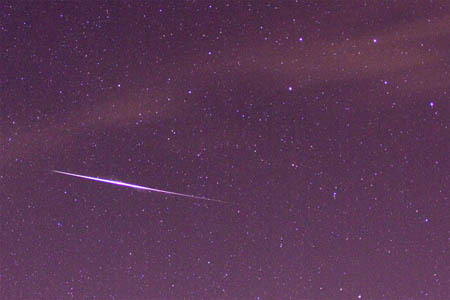 These are not Ursid meteors because they to do radiate from the right place in the sky, therefore they are called sporadic meteors. 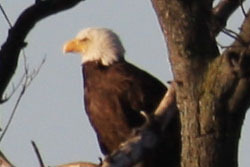 Below is a zoom crop of the first one. Below is the full image. Ursa Major (The Big Dipper) is clearly in view. This seemed like a good place to photograph based on the location of the radiant. After taking 1000+ pictures near the Ursids radiant I gave up and decided to try my luck on the western horizon above the observatory. I’m glad I did because I caught this picture.